The bed-and-breakfast is open for business, and bestselling author Tom Cook is among its first guests. Cat doesn’t know why he came all the way from New York, but she’s glad to have him among the quirkier—and far less famous—attendees. Cat's high-school sweetheart, Seth, who's fixing up the weathered home, brings on mixed emotions for Cat ... some of them a little overpowering. But it's her uncle, the local police chief, whom she'll call for help when there is a surprise ending for Tom Cook in his cozy guest room. Will a killer have the last word on the new life Cat has barely begun? I first encountered Ms. Cahoon's work through her "Tourist Trap Mysteries", specifically Tea Cups and Carnage, and isn't that a great title! Well, I say, if A Story to Kill is any indication, Cahoon will have another hit series on her hands with the "Cat Latimer Mysteries"! Talk about a heroine who can make lemonade out of lemons. It's not everyday a woman inherits her own former house because her philandering ex-husband didn't change his will after the divorce. Even fewer, I would imagine, who turn that house and its memories into a thriving business supporting the writing community. Truth be told, Tom Cook might take exception to that, disagreeing that there is benefit in being written out of one's own story (aka being murdered). But Cat demonstrates the chops to investigate this crime, to the chagrin of her uncle, 'the' local LEO. Which, incidentally, brings up another bit of refreshing Rocky Mountain air...the law enforcement element of the story does not involve the main character's love interest. Not that there's anything wrong with that, of course...but it's nice when there's something new. 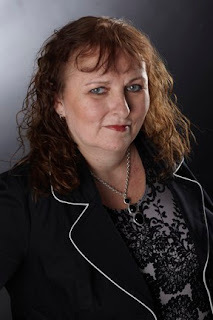 It helps keep the stories and the cozy-mystery genre specifically, fresh and creative. 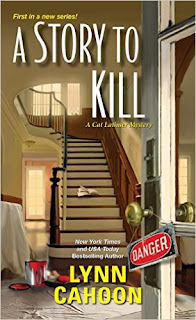 If you are looking for a great start to a new series ... and who doesn't love being in on the story from the beginning ... you will not go wrong with Cahoon's A Story to Kill. Click on the banner above to go to the tour page, where you will find links to more reviews of this title. You can also find ou t how to become a blog host for future book tours! Great review! I love the sound of this book, am looking forward to reading it. Thanks for the review. Thanks, penney, I'm glad you enjoyed the review. The book was aces! I received this from NetGalley but have yet to read it. It sounds like I have a treat in store! Thanks Becky - I love the book on the staircase. It is gorgeous, Becky. I want a staircase like that in my house one day! Love the sound of this book. I think a bed and breakfast makes for a great storyline and a great start to a new series. Can't wait to read. Having started so many series in the middle, Dianne, I'm always thrilled when I can be in from the get go!